Menace Beach is a rather odd game known, by those who have played it, to have quirky enemies and questionable intermission scenes involving a girl and her slowly disappearing clothes. 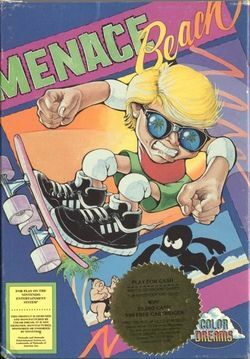 Like all Color Dreams games, Menace Beach was not officially licensed by Nintendo. When Color Dreams renamed to Wisdom Tree they renamed the game Sunday Funday: The Ride and made some aesthetic changes. While in Menace Beach the player fights ninjas and evil clowns on his way to rescue his girlfriend from Demon Dan, the hero in Sunday Funday fights bullies and businessmen on his way to Sunday school. The underlying gameplay remains identical. The cartridge also added a puzzle game called Fish Fall. This page was last edited on 5 November 2008, at 22:57.